Soil type: Ancient glacier sediment (acidic! ), porphyrite rock. Method: Hand-picked in small boxes in mid September, spontaneous fermentation, matured in cement tanks. Grapes: 80% Spanna (Nebbiolo), 20% Vespolina. Method: Spontaneous fermentation, matured for 2 years in cement tanks. Grapes: 85% Spanna (Nebbiolo), 15% Vespolina. Soil type: Volcanic porphyrite rock (acidic) with very shallow top soil. Method: Spontaneous fermentation, vinified in cement tanks, matured for at least 2 years in large oak barrels. Method: Fermented with selected yeasts, vinified in cement tanks, matured for 2+ years in large oak barrels. Marina says it has been a good vintage at Vallana, so far. Early September has been rainy and cloudy. They will probably pick in early October. “At the end of August we thought we might be picking while you were here!” In spite of variable weather, Marina’s brother Francis and I go for a vineyard tour. His car is clearly a work vehicle, covered in farm dirt, plenty of busted parts. On the drive we talk about the recent history of Vallana. Like many historically significant names in the territory, Vallana could have effectively passed into history when Francis’ father died. The tragic event left his mother with three small children and a farm with valuable land and wine but requiring constant maintenance and oversight. At that time, there were interested buyers for Vallana. Happily, Francis’ mother held on to the winery. “It was probably a foolhardy decision,” Francis said. “We may have been better off financially if she’d sold the name and the property.” He then admits that he would not be a winemaker today if she’d made that decision. The road in front of Vallana’s house/cellar is the boundary for Boca DOC. Parts of five small villages fall within its boundaries. Boca’s total surface area of 20 hectares makes it the smallest DOC in Alto Piemonte. In comparison, Gattinara has closer to 150 hectares. Banfi in Tuscany has 800 hectares: more than all of Alto Piemonte! In the middle of the 19th century, vineyards blanketed the landscape almost unbroken from Turin to Milan, 40,000 acres of grapes. They are gone, largely because of the industrial revolution. The northern Piedmont has a great infrastructure, easy transportation to Turin and Novara, so there was access to factory jobs for former subsistence farmers, and that change was appealing. Days off, guaranteed paychecks, and leaving agriculture behind for the “modern era” of 8 to 5 work… for many it made sense. Near Francis’ new vines, on a steep hill overlooking the church of Boca, we inspect a parcel still planted to the Maggiorina vine training system. It’s a three-dimensional trellising system, a square of four tall wooden posts with vines planted in the middle, stretching out in all directions. This system has many advantages. For one, you can plant potatoes underneath, or other produce. And the vines have no orientation. Some part of the canopy receives sunlight from any direction. But you can’t mechanize this. No tractor can enter the field, you can’t even efficiently cut the grass. They are expensive to maintain, and are disappearing. In a Maggiorina field one plant requires eight poles. The modern system Francis employs uses one pole for five plants. So using the old system a hectare would require 25,000 poles, at $5 a pole. And the system makes a four-meter square between plants. High cost per hectare, for few plants. Traversagna is the other Grand Cru of Boca. From 1967-1995 regional authorities mandated the use of only village appellations as DOCs. Boca, Gattinara, Ghemme, Fara. Until 1995 Spanna was legally an IGT, called Spanna del Piemonte. Now the area has adopted a dual system: wine is either DOC or red table wine. There is no IGT for Alto Piemonte in 2015. This new system is as bewilderingly flawed as the old one. To begin to unwind its complexities, Alto Piemonte is split into two provinces of Italy, divided by the Sesia river. On Boca’s side we are in the province of Novara, cross the river and you enter the province of Vercelli. So, they created two DOCs for regional wines, colli Novaresi and Coste della Sesia. The latter is a particularly funny DOC name because it uses the plural, but only applies to costa on the Vercelli province side of the river. Nightmare. Made worse because wineries in Alto Piemonte are not permitted to use the Piemonte DOC common for estates in Langhe, Monferrato etc. In fact, Francis posits the name of our company could be technically illegal on their back labels. 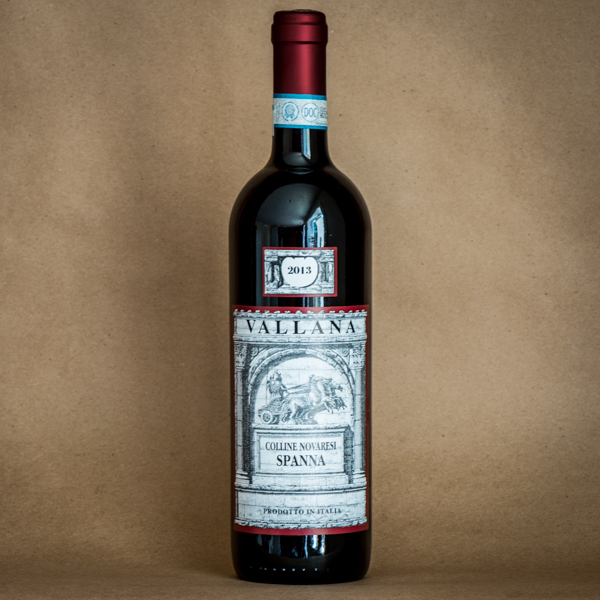 The word Piemonte is not permitted to appear anywhere on their bottles (until recently on websites and promo materials too: that absurd law was squashed) in spite of Vallana being solidly within the larger Piedmont region. The wines cannot state what they are (Alto Piemonte) because (in Francis’ opinion) more wealthy and politically powerful wineries to the south do not like the superior quality that the word “Alto” implies. It would make them by inference “Bassa Piemonte” lower, inferior. Barolo can’t have that. Ah Italy, and politics. Boca grows in 280 million year-old rock. It is very easy to break, you can almost do it by hand. The site is the tip of a super-volcano that was active 290-280 million years ago. It exploded 50 square kilometers of material. Boca is lava, volcanic rock from that explosion. It is the oldest rock on the surface of the earth. The soil is undeveloped. If you dig a hole at Boca there are no “horizons” or layers. And the topsoil is shallow. The mother rock is a meter under the surface at most. Many old vines have to be removed using an excavator because their roots become wrapped over decades around massive boulders of this rock. In this process of removal you can see vines creating their own soil, breaking apart the primary rock, extracting its diversity of minerals. This is ancient geologic history, and recent news. In 2010 a geologist from Dallas named James Quick (sounds like a cartoon hero) published a definitive and new analysis of the origins of the very diverse soil of Alto Piemonte. It eventually appeared in the wider press via Nature magazine. Until then, the farmers of the region had no clue why they had such chaotic soil! Squint our eyes (or take off your glasses) in Barbaresco, and it is easy to see the terrain as dunes of a desert. Because it was. The land was formed as a large seabed of alkaline, chalky “dunes.” You can find the shells. Boca is not rolling, the sea never made it to Alto Piemonte. The terrain of Alto Piemonte is all porphyrite rock. It is rich in minerals, but low in fertile material compost/humus etc. And that isn’t the situation only in vineyards. The swaths of forest in this area also suffer from a dearth of developed soil. Fertile stuff skitters down the cliffs to flat land around the river, an area planted primarily to corn. A clay-soil site in that area is planted to Vespolina by Vallana, because that variety craves water, particularly close to harvest. Vespolina, Bonarda and Uva Rara are traditional blending partners for Spanna (Nebbiolo) in this region. Currently you may use up to 90% Nebbiolo maximum. Francis has abandoned Bonarda and is going away from Uva Rara, too. “It’s great for the harvesters, something tasty to eat while working.” Uva Rara produces straggly clusters of small, sweet berries. Birds and humans enjoy the taste, but yield is low. What Mr. Quick eventually discovered was Boca and the surrounding 20 miles were a whole volcano, thrust upward by the collision of African and European tectonic plates, and rotated 90 degrees by the force of the collision. So geologically, Boca and all of Italy to the south is a part of Africa. Geologic Europe begins in the Alps, a few miles north. A volcano mostly exists under the earth’s surface. Alto Piemonte is the probably-unique place on the planet where you can see a whole one, on its side, and bisected by a river as well. A convenient cross-section of geologic time. Eight rock types are visible. The region is now a geo-park protected by UNESCO. In fact, Boca Montalbano is surrounded by a nature reserve. Deer, boar and birds thrive. Francis does not like chemical fertilizers. He describes his farming as organic in one breath, then mocks the concept with the next. He finds the doctrines a little preposterous. “You don’t have to choose between a great wine and a healthy wine,” he states. “I try to make wine with as little sulfites as I can.” Francis recently made a small amount of metodo classico sparkling Nebbiolo rose with only 20mg/liter of SO2. He says bluntly that drinking wine that does not cause a hangover the following day is his aim in minimizing sulfur use. According to a study conducted by the University of Milan, viticulture is one of the few commercial sectors that has a negative carbon footprint. Grapevines take carbon from the environment and store this CO2 in wine. And then it is stored in us. It is possible to visualize Alto Piemonte as a hand. Monte Rosa (the second largest mountain in Europe) is the palm, Boca, Gattinara, Ghemme, Fara: these are the fingers. The long south-streching hillside of Gattinara appears to have knuckles. We drive over to Gattinara, to see one of Vallana’s oldest vineyards. At 350-570 meters above sea level, Gattinara is slightly lower than Boca, which starts at 400 meters and rises to at least 600m. The climate is slightly warmer in Gattinara, more spots are south-facing. Boca is more diverse in its vineyard orientation, in a narrower valley, more windy. After our tour of 40-year-old vines in Gattinara, we drive south to Ghemme. We also see Fara, the border with “mare quadretti,” Italy’s area of intensive rice cultivation. The name means “sea of squares” and is an accurate description of the vast plain. The mare quadretti produces more rice than China. The locals say, “Rice is born in water and dies in wine.” Risotto is on the menu. Driving back through rice and corn country we spot a cluster of alberata, vines trellised up trees. This is an ancient thing (see Gauls, below) and was used mostly in too-fertile areas of polyculture. The trees we see are the type you’d also have for silkworms. It’s fun to chase the differences in the seven traditional village appellations of Alto Piemonte. It’s also important to keep in mind they are all less than 10 minutes apart by car. The whole area is smaller than Manhattan. Francis sources grapes for Vallana Spanna DOC from all parts of the region. Ghemme is a very important component. The area’s slightly fruitier grapes make producing a drink-young wine possible. He says this is the biggest challenge, to make a wine that doesn’t need years in the cellar to mature. To aid early drinkability Francis also removes the majority of the seeds from his Spanna. So, the Gauls: I promised! The residents of Alto Piemonte have been making wine for 2,500 years. Gauls and Celts made wine in the area, usually flavored with hops, for 500 years before the Romans arrived. The concept of winemaking was introduced to the Gauls by the Etruscans. Etruscans used live trellises (trees, see above.) The Greeks and the Romans farmed un-trellised vines that lay on the ground: that was possible in the warm Mediterranean, before Phylloxera. The southern Piedmont (Barolo/Barbaresco etc.) got its winemaking indoctrination from Liguria, whose inhabitants learned from the Greeks. From the start it was a different tradition. Unlike the Greeks, the Gauls were terrible potters… but they were good at growing trees, and woodworking. Instead of amphorae, they built barrels the size of houses to store wine. It is reasonable to believe this is the origin of making wine to age. The Gauls put wine in barrels, and likely realized that leftover wine from the previous year’s barrel tasted better than the new stuff. The Romans finally arrived around 100BC. At first everyone co-existed peacefully, the Gauls were happy to pay taxes and be left alone. Then the Cimbri showed up (always happens,) a Germanic tribe that believed the gods had presented Italy to them as a gift, a promised land. Two armies of marauding Cimbri stormed into northern Italy, one via Alto Adige, one via what’s now France, to Alto Piemonte. It was the first severe test from the north of the military dominance of the late Roman Republic. More would follow. The invaders to the east crushed one of the two major Roman armies. For some bad reason, instead of heading straight for Rome, they turned west, to meet their fellow invaders in Piemonte. But in Alto Piemonte, the Cimbrian forces had been annihilated by the second Roman army. By turning west, these recently victorious early Scandinavians put themselves between the Roman army of the west and the Roman army of the east, regrouping behind them and following… to Alto Piemonte. It was a big deal. Depending on your historian, between 80-140,000 invaders were killed, 60,000 captured. The victorious Roman general Gaius Marius is commemorated on Vallana’s label. The Romans thought the way vines were planted in Alto Piemonte was wild, like a hippie co-op in comparison to the Republic’s “conventional” agriculture. They called the vineyard area near this battle “Campi Raudi,” meaning wild fields. For them, it was the wild west. Practically speaking, the Campi Raudi bottling produced by Vallana is a red table wine because it is sourced from vines on both sides of the river. As mentioned above, there is no DOC that spans the border of Novara and Vercelli.